The GV2 features a low profile design, and sports all-rubber knurled knobs that are more comfortable to use, especially in extreme weather. The built-in industry-standard Arca-Swiss style quick release clamp makes it compatible with the many different plates available from Arca-Swiss, Kirk, Wimberly, Really Right Stuff, Foba, Novoflex, etc. The clamp also feature a spring-loaded detent pin that projects into the pockets or windows that are cut into the bottom of most manufactures (Acratech, Kirk, Really Right Stuff, etc.) quick release plates. This detent pin will prevent the plate from accidentally sliding out in the event that the knob is partially loosened. 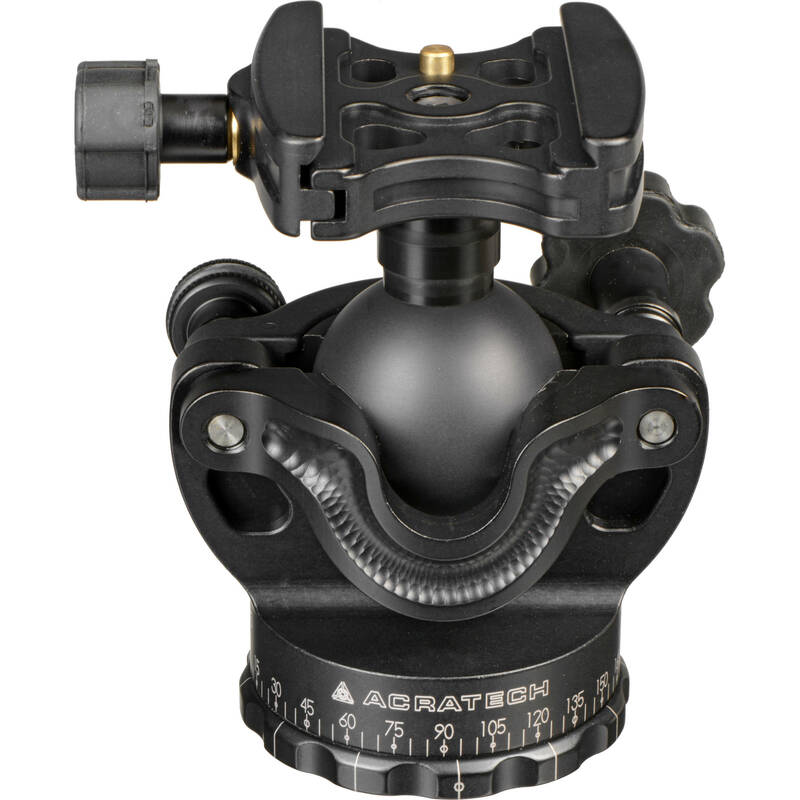 GV2 Ball Head/Gimbal with Quick Release and Pin is rated 4.8 out of 5 by 13. Rated 5 out of 5 by clcarder from Wow is the only appropriate word!! I bought this ballhead as a light alternative to my RRS BH-55 and boy was I surprised when I realized that I liked it more than the RRS. I bought it with the intention of only using the Acratech for long hikes or trips where weight was really an issue. Never did I imagine I would choose the Acratech over the RRS even for studio work. I love the Gimbal feature, no it doesn't replace a true Gimbal, but those times that I've been hiking and missed crucial shots because I didn't want to lug the Gimbal around are no more. This is the ultimate ballhead for versatility and I'm amazed nobody came up with this idea earlier. The engineering is solid and I have absolutely no complaints. Buy away you will not be dissappointed. Rated 5 out of 5 by Jason the Cameraphile from A ballhead that's ahead of its class Controls are smooth and easy to adjust. Word of warning, built in quick release clamp is NOT removable. This is done for stability/reliability reasons according to Acratech. If you want to use a different clamp or do not have a plate for an accessory you are out of luck. This ballhead supports my Canon EF 100-400mm lens with ease. Rated 5 out of 5 by Goldstein from excellent work of art I love the acratech GV2 Ball Head/Gimbal with Quick Release and Pin. Before purchasing the acratech, I bought a different ball head that was supposedly rated for 60 lbs. That product was not smooth and would creep when locked down. The GV2 is smooth as silk, and stays put when locked. I use this with a Nikon D500 and Nikon 200-500 with out a problem. Besides being very functional, it looks like a piece of art. Rated 5 out of 5 by NeilVan from Lightweight and Strong Very light and simple to operate. Works as advertised. The panning motion is very smooth. It takes a little bit to get used to the fine tuning. I use this with several DSLR's/lens combinations with no problems. It is overkill for my P&S cameras but it works. Rated 5 out of 5 by Anonymous from Excellent Prior to this, I owned a another popular American-made ballhead. It was nice, but was prone to sticking and I had to send it back to the factory for repairs. It now sticks again despite light use and proper maintenance. This ballhead is much better and handles light set ups to my 200mm lens with ease. I also like the gimbal feature - while not a true gimbal mount, it makes taking pictures in portrait mode easy, especially if I need to plug cables into my Canon 5D2. Rated 5 out of 5 by Anonymous from Like a fine precision Instrument I am an amature photograpner. I chose the GV2 without actually touching it, but found it to be the right piece of equipment. It is engineered and opperates like a fine surgical insturment. It is both rugged and precise. The tightening mechenisms require very little tensioning to get them to hold my 6.8 lb. gear. All movement is smooth like water over glass. The GV2 is very versitile, especially with the Gimbal notch, I can't imagine any position I will not be able to accomplish. I thought I would have preferred largeer Leavers rather than the thumbscrews, but these wor very well, and their various sizes make it easy for me to work them while looking through the viewfiner. I love the open architecture and expect that dirt or other debris will never get in the way or clog the movement. I coulc go on and on, this is a great piece of eqipment. Rated 5 out of 5 by Robert P. from Works as Advertised The GV2 Ballhead/Gimbal has worked perfectly for me.I have used it with my Canon 100400 L IS and have had no problems with it supporting the weight of that particular lens. My only niggle is that there are several knobs on this head and it takes a few times of using them all, before it becomes second nature using the head by feel, not so much by looking at it, while adjusting the knobs. Rated 5 out of 5 by Anonymous from Excellent construction & design Very impressed with the design & construction of the GV2. Bigger than I thought it was going to be, but very lightweight. Prefer the Manfrotto Quick Release system but this one works well as well.